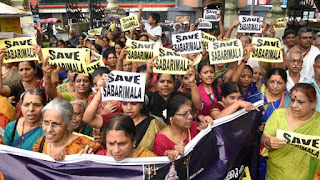 The chief demand of the movement is the prevention of entry of women aged between 10 to 50 into Shabarimala, does not have any historical grounding. Similar to what Eric Hobswam has pointed, this is an ‘invented tradition’. Entry of women was banned only in early 1970s by the Travancore Devaswom board. It got judicial sanction only through a high court judgment in 1991. So the cry of apologists about an age old tradition being trampled upon by judiciary is a manufactured one. This movement is probably the strongest Savarna reactionary movement since the Liberation struggle against Communist ministry in 1958-59. There are multiple reasons for stating this. First, true to its casteist spirit, these protests are led by Nair Service Society (NSS), Pandalam Royal family, Brahmin thantri of Shabarilamala and Sangh Parivar. While the Congress has come in support of these protests, their participation has been on the margins. It is doubtful if any movement in united Kerala has witnessed the leading presence of a royal family. Such attempts to give legitimacy to feudal vestiges are unknown in the history of post-colonial Kerala. It is also no co-incidence that it is concentrated in the south Travancore region where these reactionary forces have been historically strongest. Moreover, NSS is an organisation which filed a petition in the Supreme Court merely two weeks back to repeal caste based reservations in Kerala. The same organisation, in the most hypocritical manner wants to be the self-proclaimed leaders of the united Hindu front to save Shabarimala. Second, if the leaders of the protests were genuinely concerned about rituals and rituals alone, they would have attempted to at least conduct protests when rituals which have been historically associated with lower caste participation were unilaterally stopped in Shabarimala. Similar to Panthalam Royal family, Cheerapanchira, an Ezhava (largest lower caste community in Kerala) family, had significant traditional rights associated with rituals in Shabarimala. But gradually, they were denied these rights. Until 15 years back, the chief of tribals who reside in the nearby forest conducted a ritual which was the sprinkling of the temple idol in honey. Even this ritual was stopped. Apart from this, the entire historical association of Buddhism with Shabarimala is also eradicated in these protests. What is therefore created is a very narrow reading of the history of the temple and its deity through a Brahmanical lens. Third, what angers these Savarna forces are not even the ritualistic reformations, but a perceived anxiety that the temple will be understood more and more as a public space, thereby preventing their hegemonic hold over these and several other institutions. What they fear is a democratization of these structures. It should be noted that several leaders of this movement staged protests against the appointment of lower castes as thantris in other temples. It is precisely due to these reasons that lower caste organizations like SNDP(caste association of backward caste Ezhavas) and KPMS(caste association of Pulayas, a Dalit caste) have come against these protests. It should be noted that in the past these organisations have taken vacillating positions, sometimes progressive, and at other times regressive. An example of the latter is their open alignment with the BJP in the last assembly elections. But surprisingly, in this incident, they have taken a position against the protests. While the social base of these organisations has been marginal, their stand on this issue has helped highlight the casteist nature of these protests. The role of opposition in these protests has been extremely regressive and disappointing. While, one should not be surprised by attempts of the RSS to fish in muddy waters, their initial position was in favour of women’s entry to temples. It was only after the protests that a volte-face was conducted by them. Even now, the stand of the RSS national leadership is unclear since they welcomed the Supreme Court judgment in the initial days. In the most shameless manner, several top BJP functionaries in Kerala have resorted to even deleting their old face book posts demanding entry of women in Shabarimala. According to latest reports, it has come to light that the women who filed the petition in Supreme Court against the ban on women’s entry in Shabarimala are closely linked with RSS. Despite such revelations, in the most abhorrent manner, the Sangh Parivar continues to protest in Kerala against the apparent intervention in temples by atheist communists. Their main demand is now that the state government has to pass an ordinance against the Supreme Court judgment. Anyone with a basic understanding of the constitution knows that the state government can do almost nothing when a judgment is passed by a constitutional bench. But such facts have not come as obstacles for the RSS in upholding their fake propaganda. For Congress, their position on the protest is a frail attempt to get back those Nair voters who have deserted them for the BJP. Some of their leaders even went on to declare menstruation as impure. These positions, while they do not show justice to the pre-independence trajectory of the Congress in Kerala, when they stood firmly with several temple entry movements, are consistent with their positions in post-independence Kerala when they supported the regressive reactionary elements against the Communist party. Nevertheless, amidst these attempts by the opposition to strengthen the reactionary components of the common sense a firm resistance to uphold the progressive components of the common sense is carried out by the Left in Kerala. The position of the lower caste organisations against these protests has strengthened these attempts of the Left. Despite the mass hysteria created on the streets of Kerala, a very firm position has been taken by the LDF government, which is that the Supreme Court’s judgment will be upheld. It has given ample opportunities to the Left to problematise patriarchy and brahmanical rituals. It has been a longstanding and valid criticism the Left has not addressed these issues of patriarchy and brahminical rituals adequately in the past. 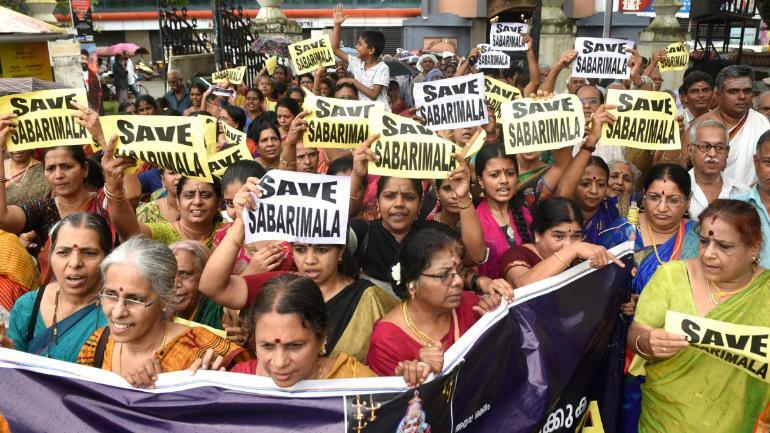 Several left leaders are using the situation to expose the casteist nature of the Shabrimala movement and the need to uphold women’s rights. Casteist slurs against the Chief Minister of Kerala (Pinarayi VIjayan belongs to Theeya community, a backward caste) by the protesters involved in this movement have only resulted in strengthening the Left narrative. Consistently, the general public is reminded of the renaissance movements in Kerala and the need to defend its values. The Shabarimala movement in several ways reminds one of the Liberation struggle against the first Communist ministry in 1958-59. Similar to that episode, all opposition parties are united against the government. While implementing progressive legislations like land-reforms irked them then, it is the dismantling of a brahmanical patriarchal ritual which angers them now. For the Muslim League, the fear is whether the judgment and government’s support for it will spiral similar attempts among Muslims. Therefore, it is clear that while presently the matter is related to a temple, the wider debate which it has initiated is about women’s empowerment. However, the contradictions are also very sharp this time. The future political trajectory of Kerala will be dependent upon the ability of Left to clinch these debates. Fortunately, the future looks hopeful. The Author is a Ph.D. scholar in Jawaharlal Nehru University, New Delhi.